Conjunctivitis, also known as pink eye, is an inflammation of the conjunctiva. This is a protective membrane that covers the visible white part of the eye and the inner side of the eyelid. Conjunctivitis makes the affected eye(s) turn red. The inflammation is commonly caused by germs such as viruses or bacteria (infectious conjunctivitis). But it is also often caused by an allergy (allergic conjunctivitis). It often affects both eyes because the infection can easily spread from one eye to the other. To prevent this from happening, it's important to avoid touching an infected eye. If you do touch it, be sure to wash your hands right away. It is also a good idea to use your own towels and washcloths, and not share them with other people. Bacterial conjunctivitis makes your eyes red and watery. The conjunctiva produces a yellowish-white discharge that makes your eyelids stick together. This is especially noticeable when you wake up in the morning. The conjunctiva can also become sore and hurt when you move your eye, and you may have an itching and burning sensation in your eyes. Viral conjunctivitis has similar symptoms, but the eyes typically secrete a more watery fluid. 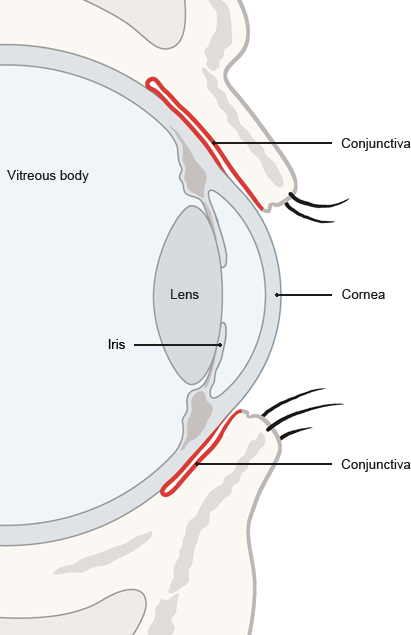 If conjunctivitis is caused by an allergy, both eyes are always affected. Here, too, the eyes water. Itching is a typical sign of an allergy. Allergic conjunctivitis is often accompanied by other allergy symptoms such as a runny nose. Poor vision, increased sensitivity to light, the feeling that you have something in your eye, or a severe headache together with nausea are rare, but may be signs of a more serious problem. It is important to see a doctor if you have any of these symptoms. Conjunctivitis is often caused by viruses or bacteria. Viral and bacterial conjunctivitis are both contagious. The germs are often transferred by touch, and the infection can spread from one eye to the other – for instance, if you touch both eyes with your fingers. But it can also spread through contact with objects such as eye drop bottles, tissues, washcloths or binoculars. Another common cause of conjunctivitis is allergic reactions – for instance, to pollen, animal fur or dust mites. Conjunctivitis can also be caused by dust or dirt, dry air, irritating liquids or damage to the conjunctiva. Sometimes the eye isn't kept moist enough with tear fluid, and that can lead to conjunctivitis too. If conjunctivitis is caused by an allergy or another external factor, it is not contagious. Bacterial conjunctivitis usually doesn't have any serious consequences. In more than half of all people, it goes away without treatment within one to two weeks. Viral conjunctivitis often goes away on its own within a few weeks too. Conjunctivitis can also become chronic. It is considered to be chronic if it lasts longer than four weeks. In rare cases the infection can spread to the cornea (the transparent front surface of the eye). This is more likely to happen if you wear contact lenses. But the risk of keratitis (inflammation of the cornea) is very small: only about 3 out of 10,000 people who wear contact lenses develop keratitis after having conjunctivitis. If you are thought to have conjunctivitis, the doctor will ask you about the typical symptoms of conjunctivitis, such as itching, the feeling that you have a foreign object in your eye, or sticky eyelids, and how long you have had these symptoms for. After that, your eyes and eyelids will be examined to find or rule out any possible injuries or external irritants. It usually isn't possible to say whether conjunctivitis is bacterial or viral based on the symptoms alone. In rare cases, a sample of the eye discharge is taken to find out what type of germs the infection is being caused by. Although conjunctivitis is more commonly caused by viruses than bacteria, doctors often prescribe antibiotic eye drops or creams "just in case." But antibiotics are only effective against bacteria, and have no effect on viruses. If the infection is viral, only the symptoms can be treated. Some people try out non-antibiotic eye drops. Cold or lukewarm compresses are also common. The effects of these treatments have not been properly studied, though. It is not clear if they are helpful, useless or possibly even harmful. If conjunctivitis is caused by an allergy, it can be treated with allergy medicines such as antihistamines or mast cell stabilizers. These are used in the form of eye drops. People who usually wear contact lenses are advised to wear glasses instead when they have conjunctivitis. Previously worn contact lenses should be cleaned particularly thoroughly if you want to use them again after the infection has cleared up. The same is true for contact lens cases. This can prevent you from getting conjunctivitis again. Berufsverband der Augenärzte Deutschlands (BVA), Deutsche Ophthalmologische Gesellschaft (DOG). Leitlinie Nr. 12: Bakterielle Konjunktivitis. August 2011.